I received an email from an educator and her group of kids who have been learning about stress, the affects it has on one's body, and how meditation can be used to relieve stress. They asked me to include this article on our page and this is why we have included this project in our webiste. Congratulations to all the students in this project and to your teachers and facilitators. Your initiative is admired and now rewarded. Thank you to the students who discovered the material on dealing with stress using meditation. 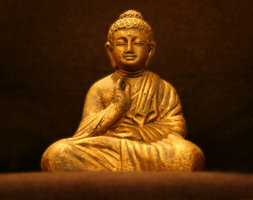 A rich resource for anyone wishing to investigate Buddhism, this is a valuable site for getting good information on the history of Buddhism and on the Mahayana, Theravada and Vajrayana schools. The Ennagram system provides a powerful set of tools for understanding and working with ourselves and other people. While its roots are very old, it has many applications for people living in the modern world. The sponsors of this site say, "The Authentic Enneagram Website provides authoritative, reliable, and practical information on the nine personality styles including the Tour of the Types in the Narrative Tradition and the Interactive Matrix of All the Types." We highly recommend this material and the Website, which presents it so clearly. This is the Home Page of an expanding publishing company with heart. More titles are added regularly. There are books for all ages. Explore what it there. You will find ways of making contact with Maggie Davis, who started the company and access to a variety of ideas and products. She writes: "Heartsong Books publishes books celebrating inter-connectedness with all life. This site represents our continuing effort to reach out in personal and welcoming ways to those who long to embrace our kinship vision. At Heartsong, we express this vision not only in the books we publish, but through gifts of money, out reach and opportunity." The Awakening Network has used Group Mail for several years. We don't usually advertise products on this site, however, the nature of this product and the wonderful service offered by the Infacta people prompt us to do so. About Group Mail: Ken says that he is very impressed with it. The basic system and its various plug-ins are very easy to use. The ease of management of multiple email accounts, the ability to check how up to date email addresses are, the capacity to test-send emails, and the variety of speed-send options, are all very impressive. He is also very impressed with the elegance of design, with the interaction of the various components, with the extensive options for managing and importing different data bases, with the speed and efficiency of all components, and more. Infoholix is a world wide web-based directory of complementary medicine. It differs from other such directories, as unlike most search engines it is a human edited directory. All our listings are by invitation or on application. This is a thoroughly professional site with all sorts of interesting avenues to explore about manhood and related issues. Currently a very high profile area of interest in the community, you will be able to find items of interest, networks for making contact, special resource information and people, and a great deal more. A wonderfully organised and vibrant site for women. This is site is geared to busy mothers who are juggling family life and other demands, often work. As the organisers say of themselves, the site is "A gateway to information, events and opportunities for a new generation of mothers ..." Always changing, each month sees new opportunities, information, competitions and other interesting things added to the site. We highly recommend it. Also, MotherInc has reciprocal links with The Awakening Network. MotherInc benefits financially from every sale made in the The Awakening Network Shop that is accessed through the MotherInc website. Open Colleges is Australia's leader in open learning. We offer over 150 flexible online courses that allow you to fit study around your lifestyle. Our accredited courses are designed in consultation with industry and include TAFE and other nationally recognised qualifications. We support you at every step of the way to ensure you achieve your goals. Start your journey towards a rewarding and successful future today! Find out more about their online courses. Our aim is to provide every Australian teenage boy with a fun, adventurous Rite of Passage transition process and ceremony to young manhood. Pathways happens in the bush, in a safe, strong, healthy and professional environment. Reiki ( pronounced ray-key)......means Universal Life Energy in Japanese. It is a simple, powerful, and effective natural art of channeling energy through body of the practitioner. Originating in Tibet, this healing art was rediscovered in Japan in the 1800's by Dr. Mikao Usui. Reiki promotes healing of physical, emotional, and spiritual imbalances. Reiki greatly enhances the healers' vitality and protects one from taking another's condition. This page gives access to a variety of aspects of Reiki and will lead you further if you are interested. It is a general information and reference Page for persons interested in learning more about Reiki. Master Charles, who lives in the U.S.A., teaches what he calls hi-tech meditation. He claims to facilitate spiritual awakening through the use of sound and other stimulation. You will find some interesting links to other sites and much information on both what is available at the Sychronicity Foundation and when you can attend various events. Trigonos especially welcomes groups interested in mainstream and complementary health, social care, community and individual development, environmental issues, sustainable land use/ agriculture, the arts and educational endeavours generally. Set in a most beautiful setting in Wales, it is ideal for residential and non-residential workshops and events. The food is beautifully prepared and arrangements can be made to cater for the special needs of attendees. The people who run the place are wonderful, easy going and caring. USANA is an international company that manufactures and sells dietary supplements and other products. These supplements are especially prepared to ensure that they can be absorbed by the body and are of the highest quality. Many people have started to use them to support their health and vitality with remarkable results, results that impact many different areas of life, including their meditation practice. We highly recommend them as something well worth testing in your own life. They are sold in several countries. Contact us at IMPG for information about purchase, should you be interested in testing them. Vicnet is a service related to the State Library of Victoria (Australia) that offers many different information and other services. It also offers site hosting and advice advice on Website design. The people are a delight and always very willing to help in whatever way they can. Its sever hosts The Awakening Network's s Website on very generour terms as we are an educational, religious, community service, non-profit organisation. Here is an impressive online shop for accessories to make your yoga practice more comfortable and interesting. We hope you enjoy browsing and buying from here. Contact links@buyyogamat.com Their resources include yoga mats and yoga equipment, yoga news, yoga information and meditation cushions. Yoga finder is a wonderfully rich resource for anyone interested in almost any aspect of yoga: Classes, Retreats, Workshops, Retreat Centres, Yoga Teacher Training Centres, Advanced Yoga Training, Yoga Events and more. Yoga is a significant part of the practices of many people associated with The Awakening Network Inc. and we highly recommend this webisite.